The mission of US Army Europe (USAREUR) is to train and lead Army Forces in support of US European Command (EUCOM) and Headquarters, Department of the Army (HQDA) by: Training and preparing full spectrum capable forces for global employment; strengthening alliances and building partner capacity through synchronized Theater Security Cooperation activities; providing Army Service Component Command and Title 10 support, Army Support to Other Services, Executive Agent delegations, and Lead Service responsibilities, as required; continually seeking to improve the readiness and quality of life of its Soldiers, Army Families and Civilian workforce by sustaining and fulfilling Army Family Covenant objectives; and providing COMEUR with a deployable contingency command post and headquarters capable of short notice deployment to fulfill emergent JTF HQs requirements. USAREUR consists of an Army Major Command, an Army Service Component Command, a corps headquarters, 2 separate heavy brigades, an airborne brigade combat team, a cavalry regiment, a theater sustainment command, the 7th Army Joint Multinational Training Command, as well as various support activities. USAREUR is also supported by forward-deployed communications and intelligence organizations. United States Army, Europe traces its lineage back first to Headquarters, United States Army Forces in the British Isles, which was first organized on 8 January 1942 in England, and to Seventh US Army, which was first constituted on 25 February 1943 in the Army of the United States as Headquarters and Headquarters Company, Seventh Army. Headquarters, United States Army Forces in the British Isles was redesignated on 8 June 1942 as Headquarters, European Theater of Operations, United States Army. Seventh US Army was formally activated on 10 July 1943 at sea off the coast of Sicily. Headquarters, European Theater of Operations, United States Army was redesignated on 1 July 1945 as Headquarters, United States Forces, European Theater. During the course of the Second World War, the two units coordinated and led operations in 7 campaigns in the European Theater of Operations: Sicily, Rome-Arno, Northern France, Southern France (with arrowhead indicating participation in the initial assault), Rhineland, Ardennes-Alsace, and Central Europe. After the end of the Second World War, Seventh US Army was inactivated on 31 March 1946 in Germany. It was subsequently reactivated on 11 June 1946 at Atlanta, Georgia. Headquarters, United States Forces, European Theater was redesignated on 15 March 1947 as Headquarters, European Command. On this same date, Seventh US Army was again inactivated at Atlanta, Georgia. Headquarters, European Command was redesignated on 1 August 1952 as Headquarters, United States Army, Europe (USAREUR). Seventh US Army was allotted on 24 November 1950 to the Regular Army and activated in Germany. Together these units took up responsibility for US Army units guarding against the Soviet Union in Europe. On 25 September 1965 Headquarters, Special Troops, Seventh Army, which had been constituted, activated, and inactivated concurrently with Headquarters and Headquarters Company, Seventh Army over the years, was consolidated with it and the consolidated unit designated as Headquarters and Headquarters Company, Seventh Army. As the years went on, USAREUR and Seventh Army continued to serve in Europe, with the same commander dual-hatted for both commands. Prior to the modular transformation in the US Army and the draw down of US forces in Europe, USAREUR maintained a forward-deployed combat force, trained and ready; prepared for immediate power projection in order to conduct and support the full spectrum of joint and multinational operations; conducted engagement activities, protected US forces and resources, conducted sustaining base operations, and ensured the readiness and well being of its personnel, in the theater, or elsewhere as directed. USAREUR by the early 2000s consisted of an Army Major Command, an Army Service Component Command, a corps headquarters with corps base forces, 2 divisional headquarters with division troops, 4 heavy brigades, an airborne brigade with 2 assigned battalion-sized airborne combat teams (ABCT) that had a motorized capability, a theater support command, an Army Training Command, and area support groups (ASG) and base support battalions (BSB) for installation management. USAREUR was also supported by forward-deployed communications and intelligence organizations. Also prior to the modular transformation and draw down in Europe, USAREUR's Command and control was focused on the following headquarters: Army Service Component Command - Seventh Army, capable of serving as a 4-star joint task force (JTF) or Combined JTF headquarters (with appropriate augmentation), a joint forces land component command headquarters, and/or an Army Force (ARFOR) headquarters in any operation; Headquarters US Army Europe, an Army Major Command, which commanded and controled base support, deployment support, and performed other Title X support operations; Headquarters V Corps, which served as a joint forces land component command headquarters (with appropriate augmentation) or an ARFOR headquarters depending on the operation; Headquarters 173rd Brigade (Abn), which was structured to serve as a JTF or Combined JTF headquarters (with appropriate augmentation), or an ARFOR headquarters depending on the operation; 21st Theater Support Command, which commanded and controled logistics and reception, staging, onward movement operations. Prior to the return of a number of facilities to various European governments as part of the draw down of US forces in Europe, Brigades were clustered around the headquarters locations of Baumholder, Friedberg, Schweinfurt, and Vilseck. The 173rd Airborne Brigade was clustered around Vicenza. The combat support/combat service support structure consisted of a logistics base in Kaiserslautern, a communications and transportation hub around Mannheim, and an intelligence node in Darmstadt. All headquarters were organized and trained to rely on reachback strategy and technology. USAREUR was the Army's forward deployed Strategic Force Projection Platform and forward deployed Intermediate Staging Base. USAREUR forces operate in a region of the world that was frequently unstable, where states could disintegrate into smaller, ethnically based entities. Migration resulting from war, economic hardship, or environmental depletion could further destabilize or fragment existing states. These security challenges were expected to continue well into the 21st century. USAREUR's location provided national political and military leaders with an Intermediate Staging Base, or an Intermediate Support Base that was much closer than those in the US to the potential conflicts or operational areas mentioned above. The USAFE bases, combined with the robust Central European transportation network and large seaports made it possible to rapidly move European based forces to contingency areas. USAREUR had been one of the most engaged and deployed theater of operations in the world. Representing only about 13 percent of the Total Army circa 2005, USAREUR provided command, control and Title X support for over two-thirds of the Army's deployed forces. A typical day might find around 20 percent of USAREUR's soldiers deployed to over 20 countries in and out of the area of responsibility. They were supported in their missions by Department of the Army and contract civilians who also had deployment readiness requirements. USAREUR forces were task organized into formations based on a rotating ready force posture. These tailored packages permited the rapid formation of trained and capable forces matched to the mission. Ready-forces were certified prior to mission assumption to ensure they were prepared to meet the required time standards. 45 days for the required objective area and forward enabling forces. USAREUR had programmed for construction or renovation all required facilities for 3 strategic deployment hubs. Two support Central Region-one located at Rhine Ordnance Barracks adjacent to Ramstein Airbase, one at a location adjacent to another airport of embarkation in the eastern division's sector. Both facilities could hold up to a battalion's worth of soldiers and equipment (personal and organizational) at any time and could fully deploy a complete brigade within 96 hours. The third, in Northern Italy, supported the Southern Region. It had the capability to stage the Light Immediate Ready Company at all times, rig and hold a battalion's worth of soldiers and equipment (personal and organizational) at any time, and could push the 173rd Airborne Brigade out within 48 hours. Additionally, a stationing plan had been implemented that ensured each deployable unit was supported by a local railhead, appropriate road network, and a regional APOD/APOE. 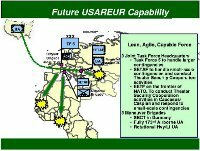 Increasing USAREUR's strategic projection capabilities required units that were quickly deployable, along with right sized support packages, and HQ units capable of split based operations. Under the FY05 End state, USAREUR would maintain the capability to deploy heavy forces to a MTW, while having an improved ability to quickly respond to lower threat environments or SASO operations. Built around a Corps Headquarters and 2 division flags, USAREUR had transitioned to a Heavy/Medium/Light force mix. TDAs were to be civilianized to free up military spaces for MTOE units, and greater AC/RC integration was to help fully man the divisions, headquarters and theater training base. The result was a USAREUR with the speed, agility and power to meet the challenges of the XXI century. 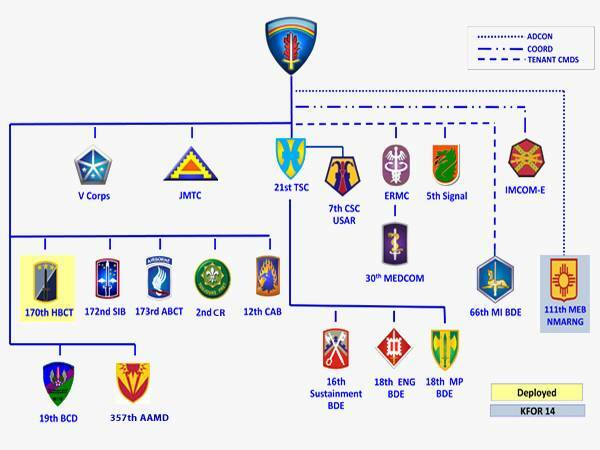 Key force structure objectives by 2005 included reconfiguring HQ, USAREUR/Seventh Army to an Army Service Component Command (ASCC) design. The goal was to standardize all AC Army HQs. This was a high payoff initiative for USAREUR, providing the opportunity to reconfigure HQ, USAREUR/Seventh Army to a design better suited to accomplishing the present and projected slate of missions and capable of acting as an ARFOR HQ. USAREUR HQ would contain a deployable Operational Headquarters capable of acting as an ARFOR, and a non-deploying MACOM staff that would execute the continuing administrative theater tasks. These new split based and tactical capabilities would strengthen USAREUR's ability to accomplish all 5 fundamental imperatives. USAREUR designed and implemented a more capable Corps HQ and Corps base. V Corps HQ design was adjusted to improve its ability to function as a deployable HQ. Enhancements included strengthening the plans, logistics plans, and movement control cells, as well as deep operations capabilities and information operations functions. The result was to be a Corps HQ that could quickly deploy as an organic, trained unit and accomplish all assigned tasks as a JFLCC HQ. This deployable element was for a time referred to as Task Force 5 (TF 5). The structure of TF 5 was derived from the existing V Corps headquarters and was a 3-star Joint Task Force (JTF) capable headquarters, stationed in Germany fulfilling Commander, EUCOM's requirement for large contingencies. TF 5 could be tailored to serve as a 3-star JTF or Joint Forces Land Component Command (JFLCC) headquarters, and would employ the most modern and combat proven Command, Control, Communications, Computer, Intelligence, Surveillance and Reconnaissance (C41SR) systems available in the Army. In concert with the Corps HQ enhancements, the Corps base was to be made more capable with the addition of needed deployment enhancers and support units. This was expected to entail a realignment of AC/RC and CONUS/OCONUS force mix to ensure immediate deployers/enablers are in theater and fully manned, while other units were habitually associated with V Corps and available in an acceptable amount of time. Furthermore, USAREUR would continue to maintain the Southern European Task Force (SETAF) and establish a similar task force Eastern Europe. The Eastern European Task Force (EETAF) proposal eventually morphed into Joint Task Force - East, which was led by USAREUR, but was a joint effort. USAREUR was transitioning to a Heavy/Medium/Light force mix. The cornerstone of USAREUR's organizational change by 2005 was modification of some combat units to a design that allowed rapid deployment of significant light or medium weight combat forces, while retaining a heavy MTW capability. Intent was to retain 2 divisional flags in theater and SETAF's light capability, but adjust the type of combat forces organic to some or all of those HQs. Specific combat force objectives were at least one Interim Brigade Combat Team and an additional Light Infantry Battalion in Theater. USAREUR was improving theater logistic capability. This action was closely aligned with the redesign of USAREUR/Seventh Army HQ and the strengthening of the Corps base. 21st Theater Sustainment Command (Provisional) would separate theater and deployment logistics, enhancing USAREUR's deployment posture and ARFOR capabilities, while retaining the ability to continue uninterrupted theater support operations. COSCOM would be strengthened through focused ALO upgrades, and an assessment of the right mix of AC/RC and CONUS/OCONUS capabilities. USAREUR was strengthening the theater training base. 7th Army Training Center was responsible for conducting the tough, realistic training that prepared USAREUR soldiers and units for deployment. This mission was absolutely vital to USAREUR's success, and would be resourced at a higher level to ensure the theater training capability remained high quality and capable of meeting the ever increasing unit training requirements. Personnel would be added to the NCO academy, and CMTC capabilities would be made more robust by an increase in observer controllers and OPFOR infantry. The glide slope to 2010 began in 2005. The objective was a USAREUR with a full spectrum Heavy/Medium/Light force mix, controlled by modular theater and Corps headquarters capable of split based and joint operations, supported by a robust theater and Corps base. As a full player in the Army transformation USAREUR in 2010 was to have received mature and proven digitization equipment, and theater forces were to be fully compatible with other army units world wide. 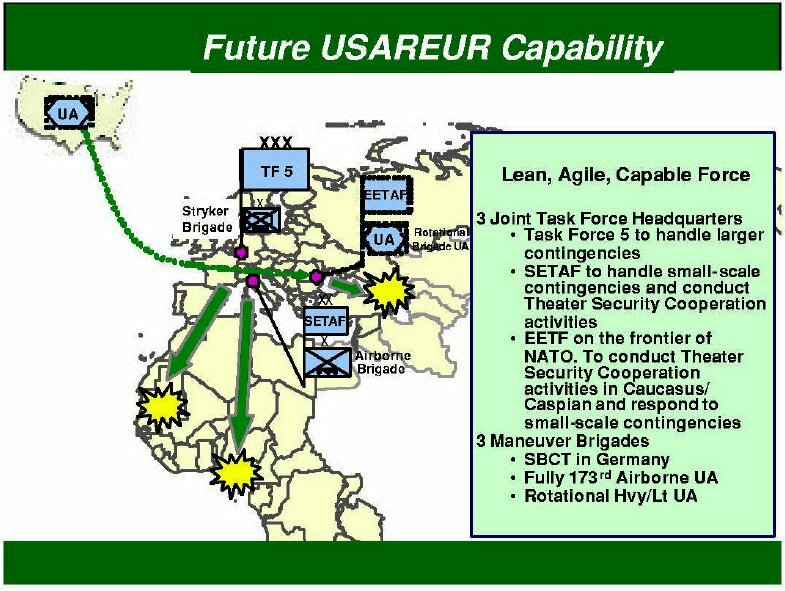 A modern front line force, USAREUR in 2010 would retain the ability to rapidly adjust force structure to meet emerging threats and missions while accomplishing always the 5 USAREUR fundamental imperatives. Specific force structure objectives were a full, 2 Interim Brigade Combat Team Division, and a more capable SETAF with increased lethality and staying power. In December 2008, as a result of the creation of a dedicated US Africa Command (AFRICOM), the US Army removed the Southern European Task Force from USAREUR, making it the Army component headquarters for AFRICOM, US Army Africa (USARAF). Also in 2008, the Department of the Army had announced its intention to inactivate V Corps in 2009 as a by-product of the Base Realignment and Closure decisions, which had precipitated a large draw down of US forces in Europe. On 4 June 2009, the Department of the Army announced that it had delayed, at least for one year, its original intention to inactivate V Corps. While V Corps remained active, many of its component maneuver units were inactivated. The 1st Armored Division and 1st Infantry Division were effectively replaced by 2 separate Brigade Combat Teams and a Cavalry Regiment. Headquarters, United States Army, Europe was consolidated on 17 April 2010 with Headquarters and Headquarters Company, Seventh Army, and the consolidated unit was concurrently reorganized and redesignated as Headquarters and Headquarters Battalion, United States Army Europe. At that time, Seventh Army was dropped from the unit's name. The 1st Armored Division Headquarters remained in Germany as of 2010, assigned to USAREUR, but its brigade combat teams were all relocated to CONUS by 2009. It was expected to eventually relocated to CONUS to join the rest of the Division. On 24 May 2011, a ceremony was held at Fort Bliss, Texas to mark to formal arrival of 1st Armored Division Headquarters, the last unit of the 1st Armored Division to return to the United States from Germany. On 12 January 2012, Defense Secretary Leon E. Panetta that as part of a new, 10-year defense strategy announced by President Barack Obama earlier in the month, which emphasized air-sea doctrine to better allow the United States to confront more than one threat at a time, the Army would withdraw 2 brigade combat teams from Europe, while retaining a strong presence in the region via rotational units. On 16 February 2012, the Department of Defense outlined the force posture adjustments. 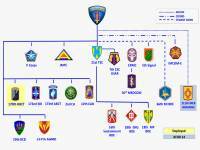 It was expected at that time that the 170th and 172nd Infantry Brigades would be inactivated between FY13 and FY14, along with V Corps. The 173rd Airborne Brigade Combat Team would relocate its elements in Germany to Italy during FY13 In addition, USAREUR installation consolidation was to be completed by FY15, including the previously planned consolidation of USAREUR Headquarters to Wiesbaden. This consolidation would affect approximately ~250 local national personnel at Heidelberg, when that facility closed, along with an additional approximately 500 local nationals with the closure of Schweinfurt and Bamberg facilities relating to the consolidation of the 173rd Airborne Brigade Combat Team in Italy. Between FY13 and FY17, USAREUR also planned to inactivate enabler units totalling approximately 2,500 personnel. It was expected that the Army would decide on which units to inactivate during 2012 and soldiers would be notified as far in advance as practical. Affected soldiers would also conduct routine moves as units inactivate. The Army and USAREUR would conduct a detailed analysis of implications once the enabler units slated for inactivation were identified. On 9 October 2012, at a ceremony at Smith Barracks in Germany, the 170th Infantry Brigade (Separate) cased its colors, marking its inactivation as part of planned drawdowns. The inactivation also marked the departure of US combat soldiers from Baumholder after more than 50 years. On 31 May 2013, the 172nd Infantry Brigade (Separate) was inactivated, continuing the planned inactivations in USAREUR. On 12 June 2013, V Corps was inactivated during a ceremony at Wiesbaden's Schloss Biebrich. At that time 2 steamers were presented to the Corps for its service. The V Corps inactivation was a major milestone in USAREUR's transformation to a more agile force built around the 2nd Cavalry Regiment, equipped with highly mobile Stryker combat vehicles, and the 173rd Airborne Brigade Combat Team.